Product #2164 | SKU DI8A | 0.0 (no ratings yet) Thanks for your rating! 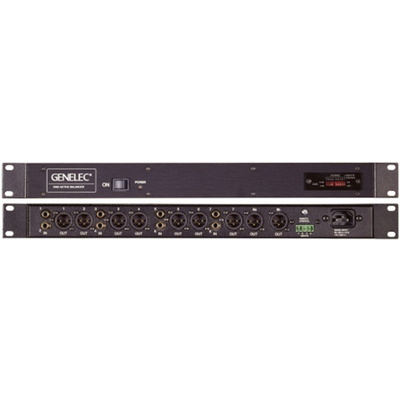 Genelec DI8A Active Balancer converts an unbalanced line signal to a balanced line signal, thereby reducing its susceptibility to electronic interference on long cable runs. It is the perfect complement for unbalanced signal source outputs and Genelec's Active Monitors. It has eight independent signal channels. One of the channels has duplicated outputs, providing easy connection for twin subwoofers in large systems. All signal input connectors are gold-plated RCA's and professional quality XLR's are used for the output channels. A +6 dB gain switch is provided for each channel for increasing the signal level from sources with low output levels. '12V trigger' and 'contact closure' terminals are provided for remote control muting. On/Off muting prevents power cycling noises.